The June 1, 2017, version of this report corrects Chart 1. The original chart reported first-quarter data for each year; the chart has been corrected to show annual data instead. 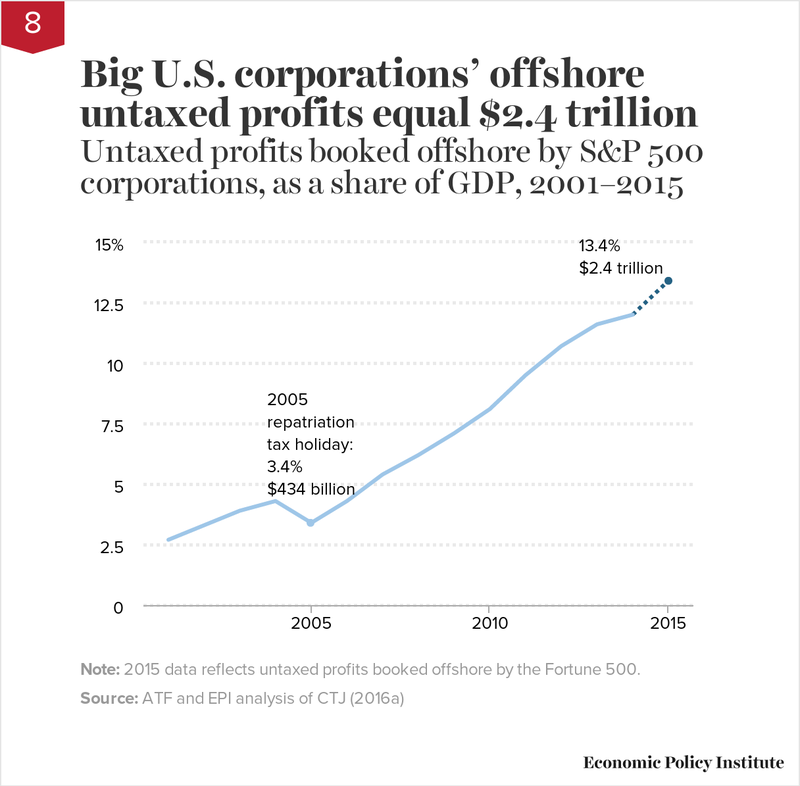 In recent years, corporate profits have reached record highs, and so too has the amount of untaxed profits U.S. corporations have stashed offshore: $2.4 trillion. And it is estimated corporations could owe as much as $700 billion on those profits. In short, corporations are dodging more and more of their tax responsibilities. This chartbook details the extent of corporate tax avoidance. Many corporations pay an effective tax rate that is one-half (or less) of the official 35 percent tax rate. Just 50 companies hold over 75 percent of untaxed offshore profits. Ten companies hold 39 percent of these profits. Just four companies—Apple, Pfizer, Microsoft, and General Electric—hold one-quarter of all untaxed offshore profits. About 55 percent of U.S. corporate offshore profits are in tax-haven countries. 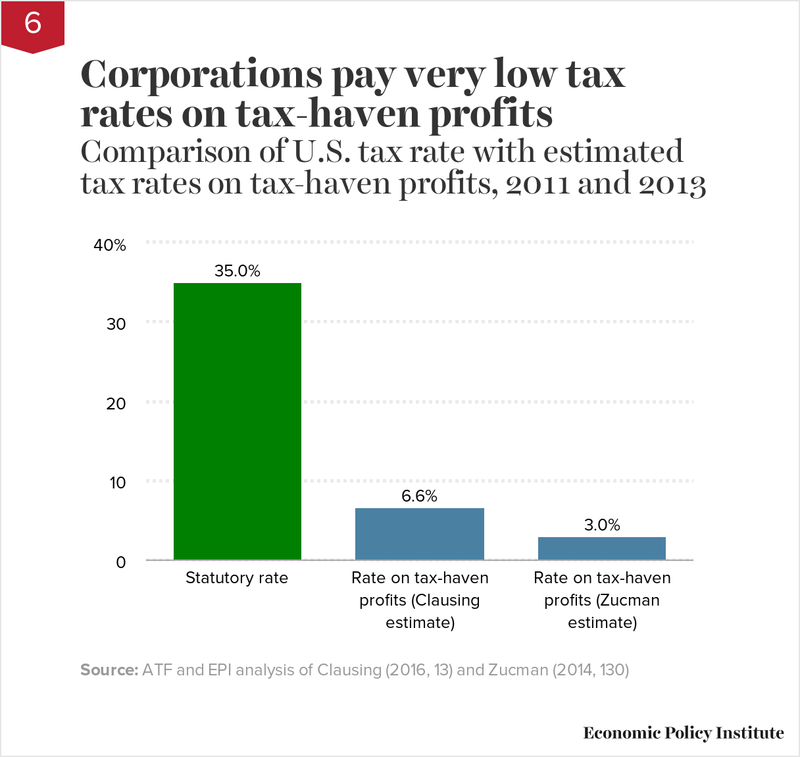 Corporations pay an average tax rate of between just 3.0 percent and 6.6 percent on profits in tax havens. U.S. corporations pay very low tax rates—6 percent to 10 percent, mainly to foreign governments—on all their offshore profits. A tax break known as “deferral” allows them to delay paying U.S. taxes until the profits are repatriated to the parent corporation in the United States. The U.S. Treasury will lose $1.3 trillion over 10 years—about $126 billion a year—due to the deferral of taxes on offshore profits. 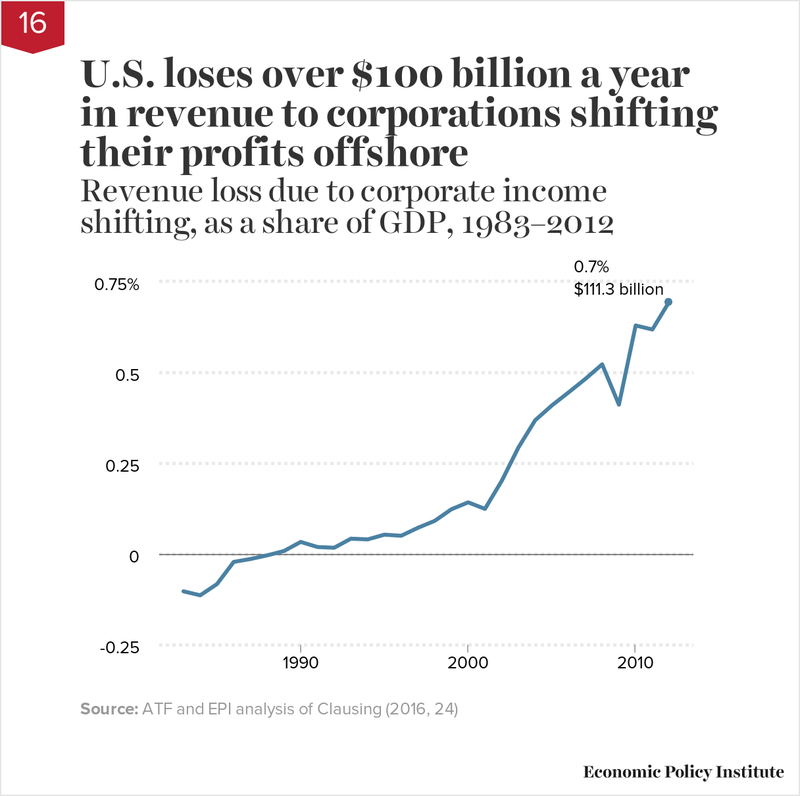 Income shifting—making profits earned in the United States look as if they were earned offshore—erodes our corporate tax base by over $100 billion a year. U.S. corporations increasingly manipulate transfer pricing and bilateral tax agreements to make their U.S. profits appear to be earned in tax havens. 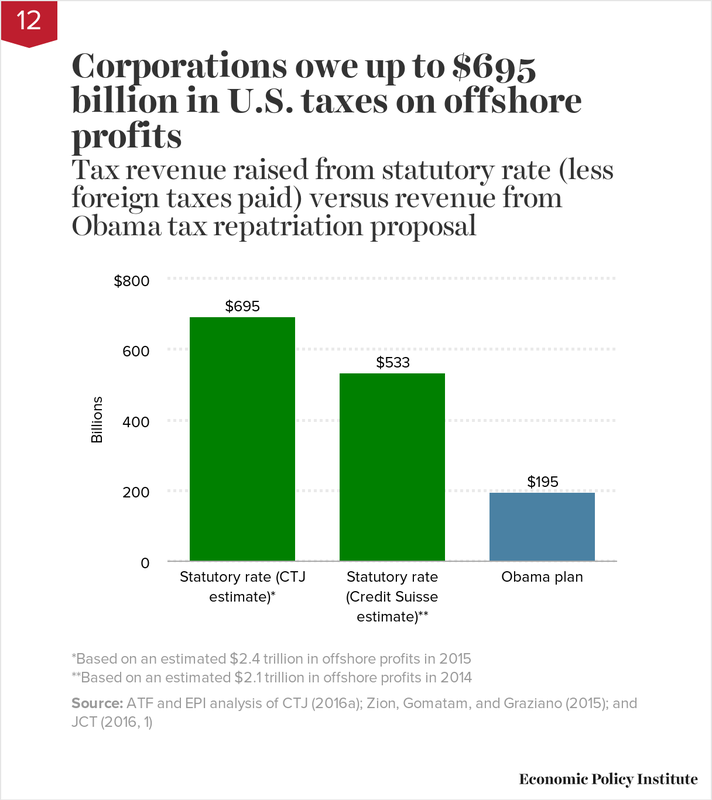 Corporations owe up to $695 billion in U.S. taxes on their $2.4 trillion in offshore profits. Having paid just 6 percent to 10 percent in taxes to foreign governments, they owe between 29 percent and 25 percent in U.S. taxes, based on a 35 percent tax rate with foreign tax credits. President Obama has proposed taxing the current stock of offshore profits at 14 percent (less foreign taxes paid), which could give corporations a tax cut of $500 billion on their offshore profits. (Republicans propose an even bigger tax break.) A 14 percent tax rate would raise just $195 billion. This is $500 billion less than the up to $695 billion they owe. That’s a tax cut of up to 72 percent for the country’s worst tax dodgers. Some large multinationals adept at tax dodging would receive huge tax breaks under Obama’s plan. Apple would get a tax break of $36.5 billion, Microsoft $20.7 billion, and Citigroup $7.1 billion (based on the profits they had stashed offshore at the end of 2015). 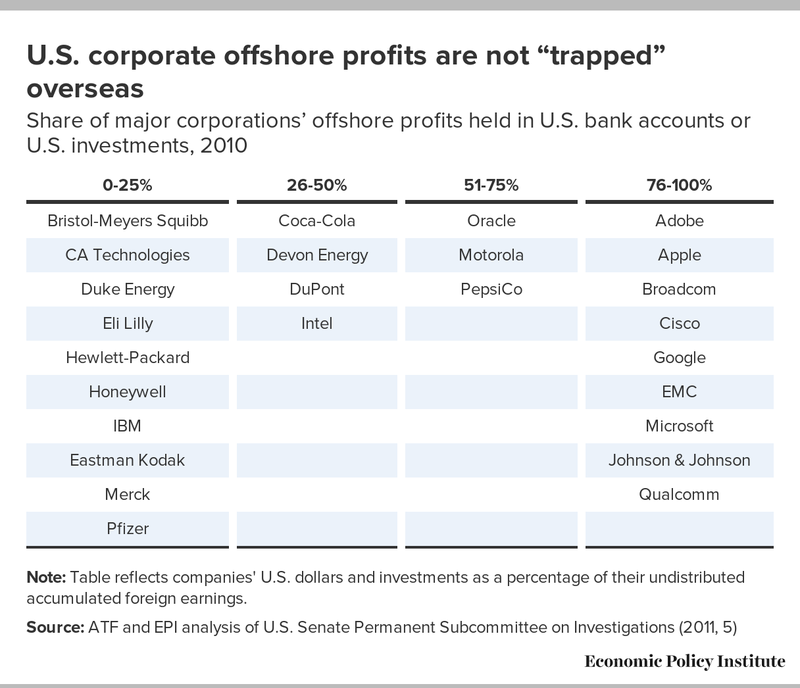 U.S. corporate offshore profits are not “trapped” overseas. Companies can invest these untaxed profits in any U.S. firm, deposit them in any U.S. bank, or use them to purchase any government security as long as it is not directly invested in the U.S. parent. A congressional study found that 46 percent of the offshore profits of 27 companies were invested in the United States in 2010. And, of course, nothing stops them from simply returning profits home—except for a desire to not pay taxes. Corporate reorganization here in the United States likely further erodes the corporate tax base by $100 billion a year. In the United States, the business sector has substantially reorganized as pass-through entities in search of lower tax bills. Note: For source documentation, see the source line of each chart. Note: Figure depicts profit margins in the non-financial corporate sector. 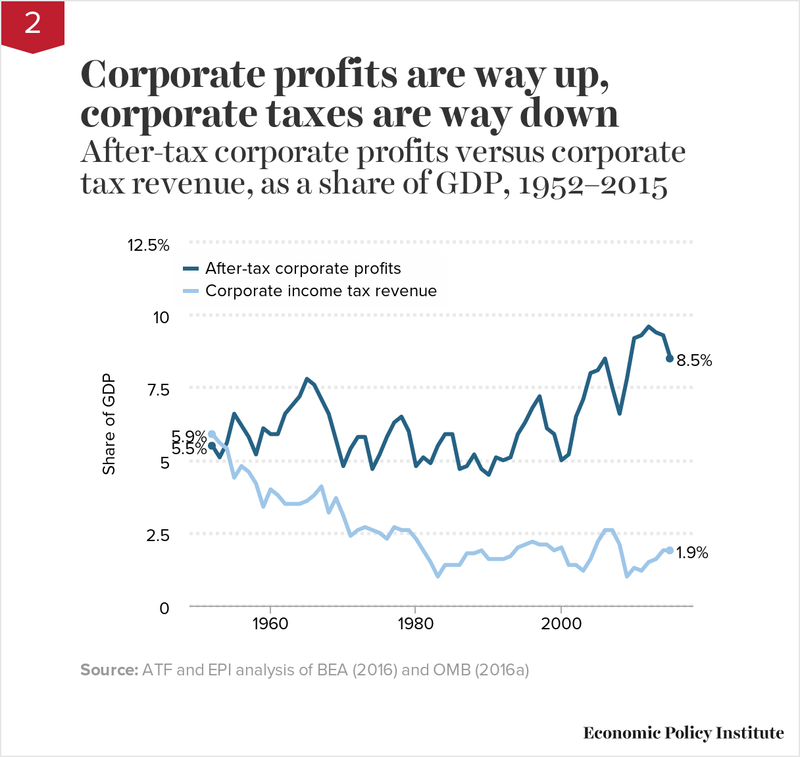 Corporate profits don’t support the claim that U.S. corporations need tax relief to become more competitive. 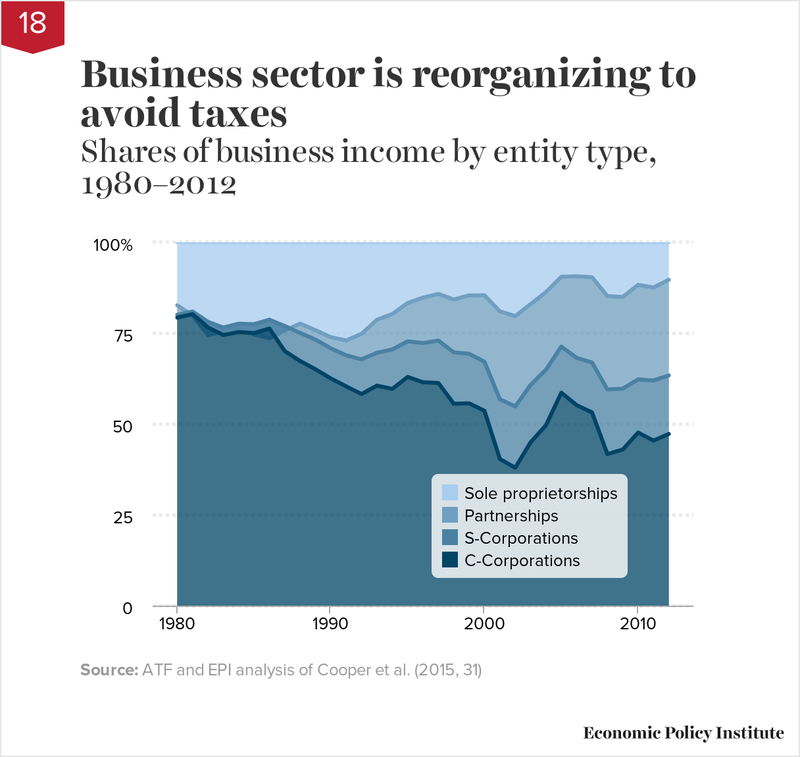 In recent years, in the U.S. non-financial corporate sector, both pre-tax and post-tax profit margins—the share of revenues claimed by profits rather than employee compensation or other business costs—are at their highest levels since the mid-to-late 1960s. Corporations complain about high tax rates stifling economic growth and profitability. But since 1952, corporate profits as a share of the economy have risen dramatically (from 5.5 percent to 8.5 percent), while corporate taxes as a share of the economy have plummeted (from 5.9 percent to just 1.9 percent). That is a 55 percent increase in profits and a 68 percent decrease in taxes. 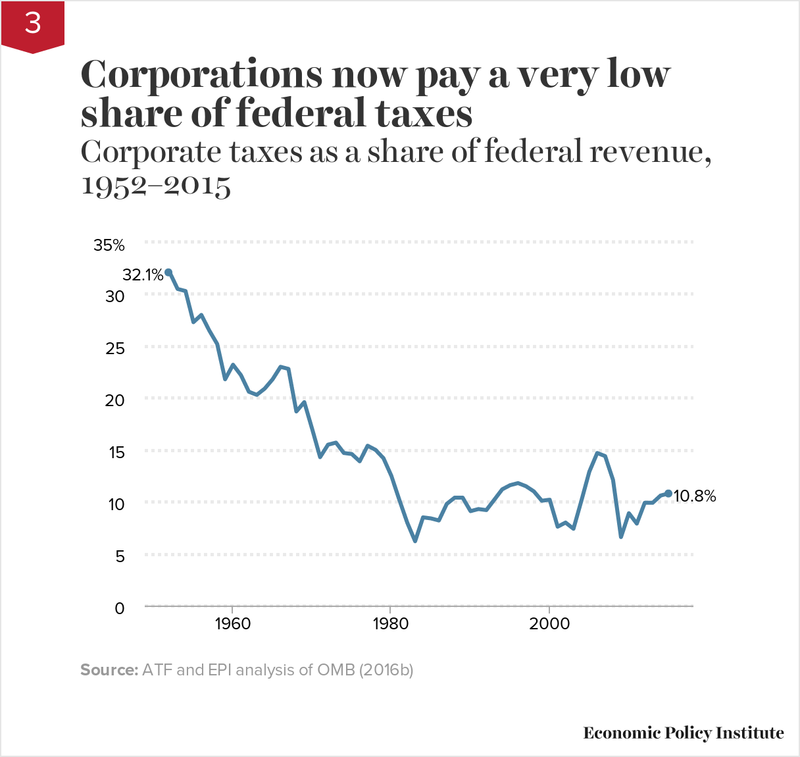 Federal revenue contributed by corporate taxes has dropped by two-thirds over the last six decades—from 32.1 percent in 1952 to 10.8 percent in 2015. Corporations used to contribute $1 out of every $3 in federal revenue. Today, they contribute just $1 out of every $9—at a time when they have never been more profitable. When corporations do not pay their fair share of taxes, public investments can suffer. While there may not be a direct cause and effect, it is worth noting that corporate profits as a share of the economy have risen by 37 percent over the last six decades—from 6.2 percent in 1956 to 8.5 percent today. 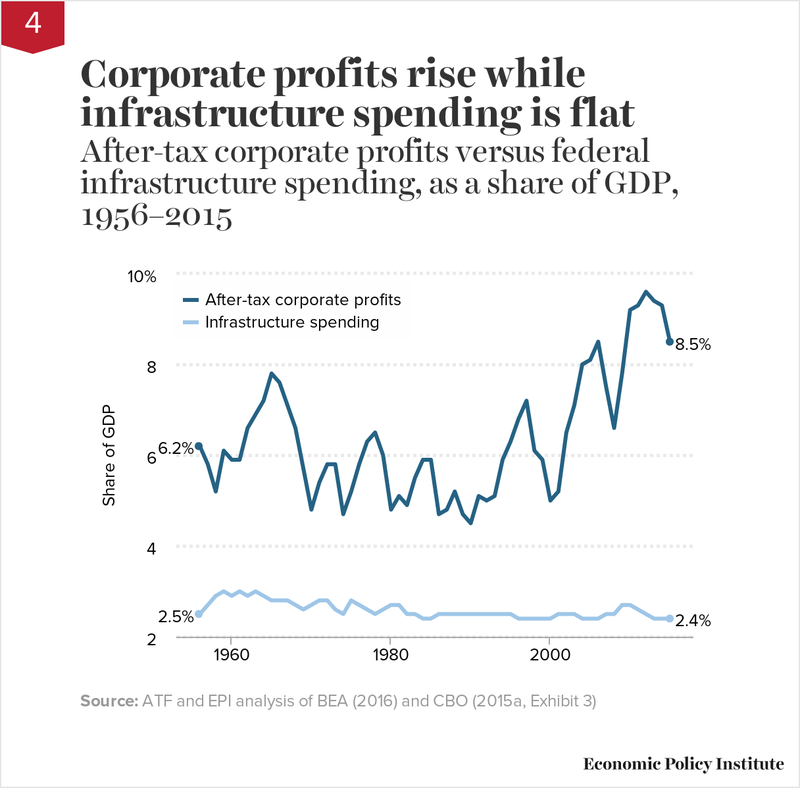 At the same time, federal spending on infrastructure as a share of the economy has remained flat, while the U.S. population has ballooned. Many corporations do not pay the official 35 percent federal tax rate on all their profits (domestic and offshore combined). Citizens for Tax Justice (McIntyre, Gardner, and Phillips 2014) found that Fortune 500 companies that were profitable over 5 years paid a 19.4 percent federal corporate income tax rate. Using data from Gabriel Zucman (2014) we find that over 2010–2013, the effective U.S. federal corporate tax rate was 12.5 percent—down from 43 percent in the 1950s. Similarly, the Government Accountability Office (GAO 2014) found that profitable U.S. corporations paid an effective federal tax rate of 14 percent on their worldwide income over 2008–2012. The official, or statutory, U.S. corporate tax rate is 35 percent. But that is not what most companies pay, especially multinational corporations that are able to shift profits to tax havens. Two major studies show that the average effective tax rates on profits in tax havens range from just 3.0 percent to 6.6 percent (Clausing 2016; Zucman 2014). Such a low rate for multinationals requires the rest of us to make up the difference. It also gives them an unfair advantage over domestic firms, many of which pay close to the statutory rate. 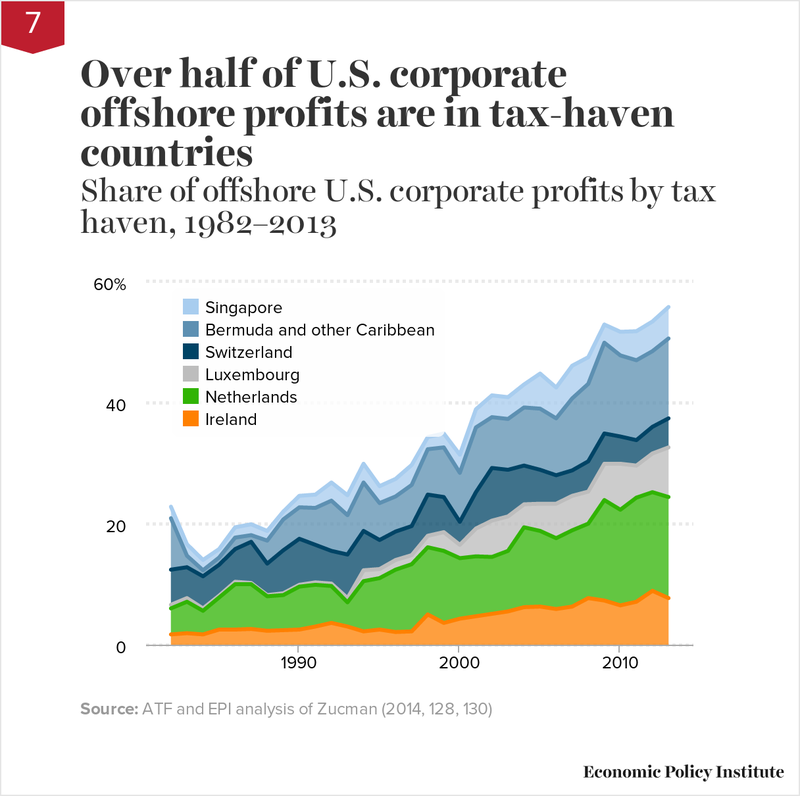 The share of U.S. offshore corporate profits that are in tax-haven countries has increased dramatically since 1982—from about 23 percent of the total to 55 percent in 2013. Corporations shift profits to these low-tax jurisdictions—which include Ireland, the Netherlands, Luxembourg, Switzerland, Bermuda, and Singapore—to dodge paying their fair share of taxes. Note: 2015 data reflects untaxed profits booked offshore by the Fortune 500. Corporations had $2.4 trillion in profits booked offshore in 2015 (CTJ 2016a). This is equal to 13.4 percent of U.S. GDP. This has risen from $2.1 trillion as of 2014 (Credit Suisse 2015). Corporations have not paid any U.S. taxes on these profits because our tax system lets them defer paying taxes until that income is brought back to the U.S. parent corporation (i.e., repatriated). The amount of untaxed offshore profits stood at $434 billion in 2005. This means it has increased nearly five-fold over 10 years—four-fold as a share of GDP. Congress established a one-time repatriation tax holiday in 2004 with a tax rate of just 5.25 percent, which took effect in 2005. Corporations were barred from using the funds for stock buybacks, but it is estimated that up to 92 cents of every dollar repatriated went to shareholders, primarily through stock repurchases (Dharmapala et al. 2009, 26). Since then, offshore profits have increased dramatically in anticipation of another tax holiday. 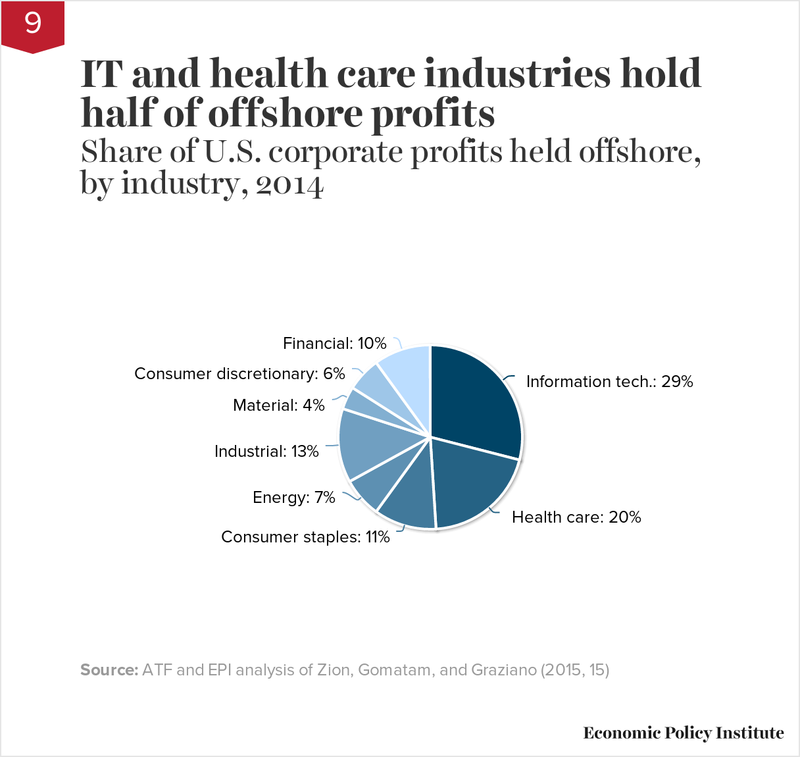 Just two industries—high-tech/information technology and pharmaceutical/health care—hold about half of offshore profits. Information technology firms hold 29 percent, while health care companies, primarily pharmaceutical firms, hold 20 percent. Companies that earn their profits from intellectual property, such as patents, are best able to shift their profits to tax havens. Proponents of corporate tax breaks will often refer to offshore corporate profits as “trapped.” For instance, Apple CEO Tim Cook has stated that “almost nobody’s bringing back their money” (NPR 2015). However, in reality it is simply that large multinational corporations don’t want to pay the taxes they owe. 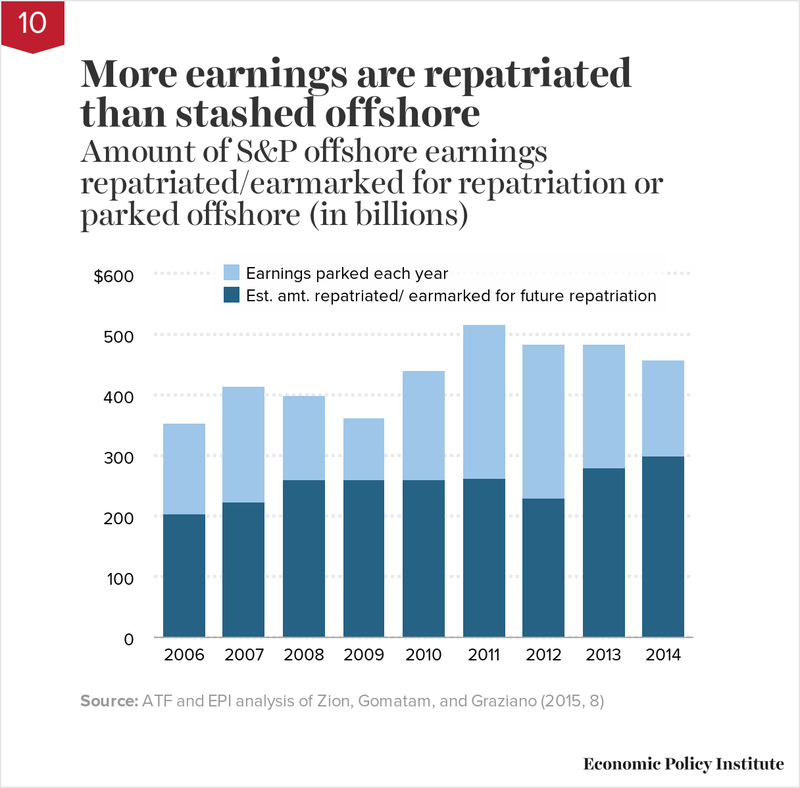 A Credit Suisse report shows that in every year but one between 2006 and 2014, more U.S. offshore earnings were repatriated or were earmarked for future repatriation than were stashed offshore. This tells us that many American corporations are in fact bringing their money back home and paying the taxes they owe. Rather, as detailed in the next few charts, offshore tax avoidance is mainly about particular large multinational corporations that refuse to pay the taxes they owe. By the end of 2015, Fortune 500 companies held $2.4 trillion in profits booked offshore. Just four corporations—Apple, Pfizer, Microsoft, and General Electric—had one-quarter of these untaxed profits offshore. Only 10 corporations hold nearly 40 percent of them, and 50 companies hold more than three-quarters of these untaxed offshore profits. 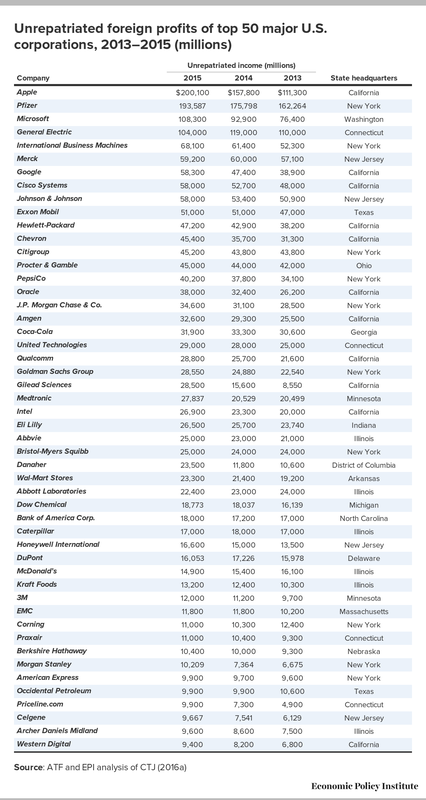 (See Appendix Table A1 for the list of all 50 companies.) These corporations are the most adept at dodging taxes because of their ability to shift profits offshore. The share of corporate income paid in taxes to foreign governments on offshore profits stands at between 6.4 percent and 10.0 percent, according to respected estimates. That means U.S. corporations will owe to the U.S. Treasury between 28.6 percent and 25 percent when their profits are repatriated, based on a 35 percent tax rate (less deductions for foreign taxes paid). Thus, corporations owe between $533 billion (based on $2.1 trillion in offshore profits in 2014) and $695 billion on those offshore profits (based on $2.4 trillion in offshore profits in 2015). President Obama’s corporate tax reform plan proposes that a mandatory 14 percent tax be assessed on the offshore profits (less credits for foreign taxes paid). A 14 percent rate would raise $195 billion—a tax break of roughly $500 billion from the up to $695 billion that is owed. Republicans have proposed even lower rates that would lose even more revenue. Some very large multinational corporations owe a substantial amount of U.S. taxes on their offshore profits because they have paid very little in foreign taxes, as many of these profits are booked in tax havens. For example, Apple, which reported paying just 4.6 percent in taxes on its offshore profits (CTJ 2016a, 6), owes nearly $61 billion (based on the 35 percent tax rate Apple would owe if it brought its offshore profits home, less the foreign taxes already paid). Microsoft, which reported paying just 3.1 percent on its offshore profits, owes nearly $35 billion. Citigroup owes nearly $13 billion. But these large multinational corporations would get huge tax breaks under President Obama’s proposal to apply a 14 percent tax rate to existing offshore profits. For example, Apple would owe about $24 billion—a tax break of about $37 billion from the 35 percent rate. Note: Table reflects companies' U.S. dollars and investments as a percentage of their undistributed accumulated foreign earnings. Corporations are able to accumulate offshore profits without paying U.S. taxes on them because of a loophole known as “deferral.” It lets corporations defer paying taxes on profits earned overseas indefinitely, as long as they claim it is permanently reinvested offshore. 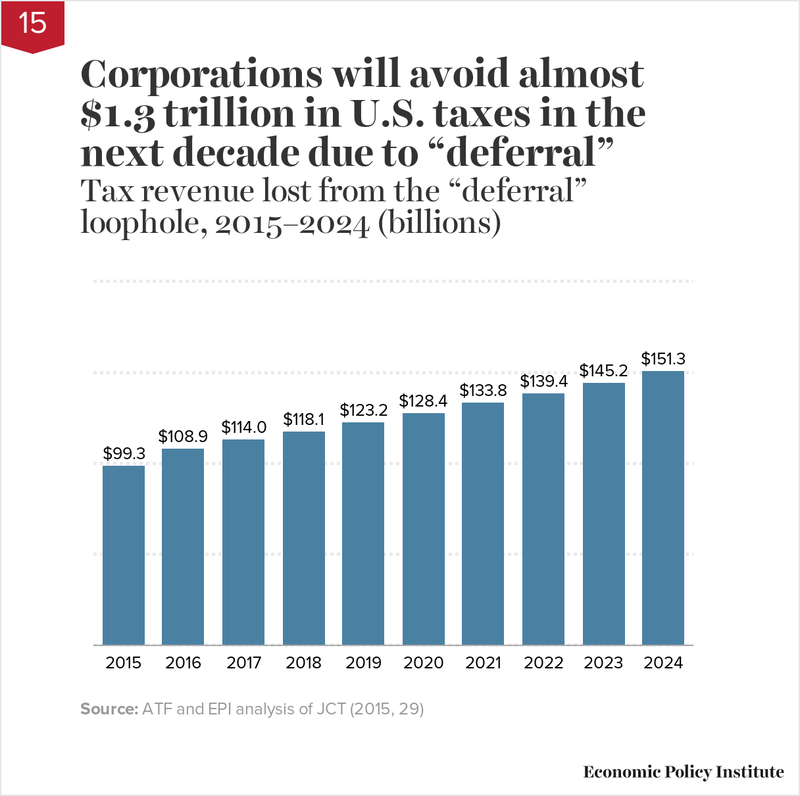 Using estimates from the Joint Committee on Taxation, we project the deferral loophole will cost the U.S. Treasury almost $1.3 trillion in tax revenues over 10 years—or $126 billion a year, on average. Ending deferral would also eliminate some incentives to ship jobs offshore, end incentives to shift profits offshore, and make the tax system more equitable so that multinational corporations no longer pay a much lower tax rate than domestic firms. 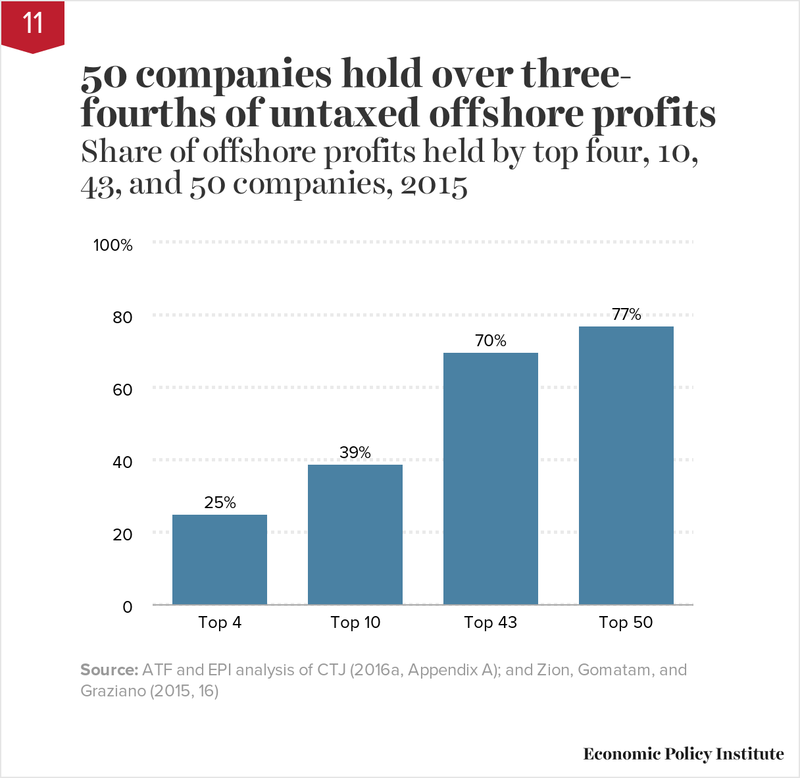 The driving forces behind offshore tax avoidance are the deferral loophole and the tax incentives that exist for multinational corporations to shift their U.S. profits to make them appear as offshore profits. That is, much of the offshore earnings that corporations can defer taxes on weren’t really earned offshore at all, and corporations have no intention of keeping them offshore. They are simply waiting for Congress to grant a new tax holiday to bring them home at a low tax rate. The resulting revenue loss to the U.S. government is growing substantially—and was $111 billion per year as of 2012. This is equal to roughly 0.7 percent of U.S. GDP. Multinational corporations can create complicated arrangements through the varied array of bilateral tax agreements that exist between countries, and they can manipulate transfer pricing rules (rules that determine the prices at which multinational corporations exchange goods and services internally). The simplest example is assigning all profits earned from royalty payments on intellectual property assets (patents, for example) to the subsidiaries of U.S. corporations based in low-tax countries. It is clear that U.S. corporations haven’t actually relocated production for the sake of “competitiveness”; they are simply dodging taxes. Of the top 10 profit locations for overseas affiliates, seven are tax havens with effective tax rates of less than 5 percent. Ninety-eight percent of the revenue loss results from profit shifting to countries with corporate tax rates of less than 15 percent. And 82 percent of revenue loss stems from profit shifting to just seven tax-haven countries. These seven tax havens are responsible for 50 percent of all foreign profits of U.S. multinational firms. And those seven tax havens account for only 5 percent of their foreign employment (Clausing 2016). 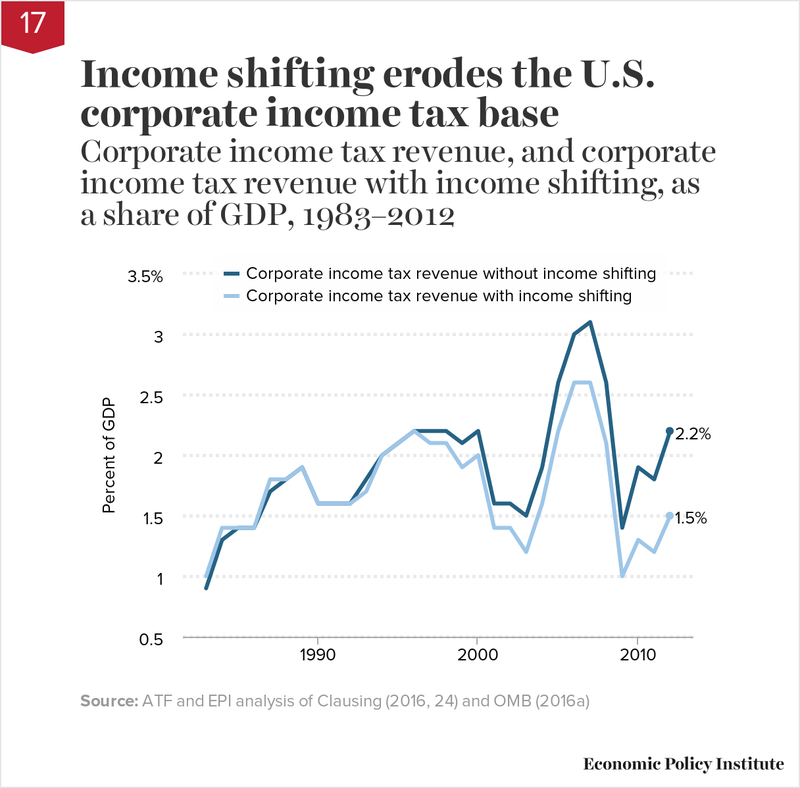 In recent years, corporate income shifting has increasingly eroded the U.S. corporate tax base. If not for income shifting, corporate income tax revenues as a share of GDP would have been almost 50 percent higher in 2012—2.2 percent rather than 1.5 percent. The reduction of corporate income tax revenue in 2012 due to income shifting is estimated at $111 billion (Clausing 2016). This is roughly the size of sequestration cuts to federal spending that Congress made in the Budget Control Act (BCA) of 2011 (Kogan 2013). The BCA-driven cuts remain the single biggest reason why full recovery from the Great Recession has taken more than 7 years to arrive (Bivens 2016). In short, the budgetary effects are likely to have been roughly equivalent had Congress tackled corporate income shifting in 2012 rather than enforcing arbitrary spending cuts. And ending corporate income shifting would have provided much less of an economic drag than did the BCA spending cuts. While the scale of offshore tax avoidance is enormous, it shouldn’t be overlooked that businesses likely avoid taxes about as much here in the United States. Increasingly, the business sector is reorganizing as various “pass-through” entities to avoid taxes. Pass-through entities are businesses whose incomes are not taxed at the corporate level, but instead “passed through” entirely to the business owners and then taxed at individual income-tax levels. The most dramatic shift is the rise in partnership income. In 1980, partnerships (a relationship where two or more persons join to carry on a trade or business) accounted for 2.6 percent of business income. Today they account for 26 percent. The rise of pass-through income has eroded the corporate income tax base. Standard C-corporations (which pay the corporate income tax) accounted for almost 80 percent of business income in 1980. By 2012, they accounted for only 47 percent. Increasingly, evidence points to the rise of pass-through business income being due to tax avoidance. Cooper et al. (2015) note that their inability to unambiguously trace 30 percent of partnership income to an ultimate owner or originating partnership lends evidence to the belief that firms are organizing opaquely in partnership form to minimize their taxes. 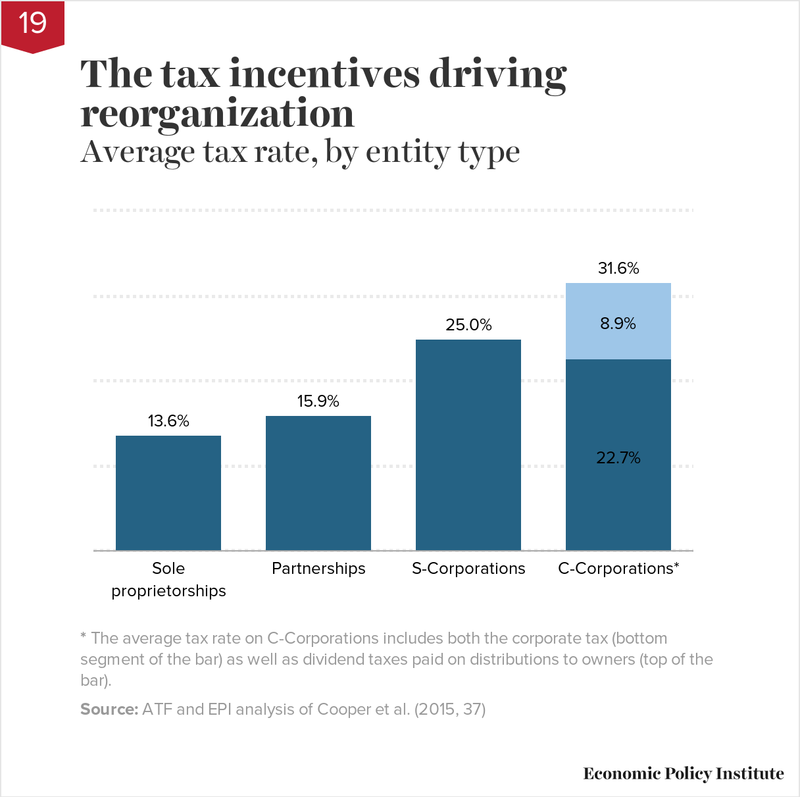 * The average tax rate on C-Corporations includes both the corporate tax (bottom segment of the bar) as well as dividend taxes paid on distributions to owners (top of the bar). As with the rise of offshore profits, the rise of reorganization is likely due to the available tax incentives. Pass-through entities can avoid the first layer of the corporate income tax (i.e., the 35 percent statutory rate), and further minimize taxes by organizing opaquely. The capital income generated by standard C-corporations faces an average total tax rate of 31.6 percent. This rate includes not just an estimated 22.7 percent rate on C-corporations, but also an effective 8.9 percent tax on dividends. On the other hand, by organizing as an S-corporation, a company can expect an average tax rate of 25 percent. And indeed, it appears businesses have responded to these tax incentives. S-corporations have grown as a share of business income from less than 1 percent in 1980 to about 16 percent today. Even more lucrative are the tax avoidance strategies available to partnerships. Partnerships face an average tax rate of just 15.9 percent. And one of the largest tax incentives in partnership organization is the ability to organize opaquely. Cooper et al. (2015) find that collapsing all circular partnerships (where partnership income could not be uniquely linked to non-partnership owners) into one would imply they pay a rate of about 8.8 percent. Like offshore tax avoidance, this costs the rest of us in the form of forgone tax revenue. If pass-through activity had remained at 1980s levels, Cooper et al. (2015) find that 2011 tax revenue would have been approximately $100 billion higher. Frank Clemente is executive director of Americans for Tax Fairness, which he helped to found in 2012. Previously he was campaign manager for the Strengthen Social Security Campaign, a coalition of 320 organizations. Prior to that he managed a health care campaign for the Communications Workers of America in support of the Affordable Care Act. He was issue campaigns director at the Change to Win Labor Federation and director of Public Citizen’s Congress Watch, a national consumer watchdog organization. Frank also has been senior policy advisor to the U.S. House Committee on Government Operations and issues director for Jesse Jackson’s 1988 presidential campaign. Frank edited Keep Hope Alive: Jesse Jackson’s 1988 Presidential Campaign. Hunter Blair joined EPI in 2016 as a budget analyst, in which capacity he researches tax, budget, and infrastructure policy. He attended New York University, where he majored in math and economics. Blair received his master’s in economics from Cornell University. Nick Trokel is research associate at Americans for Tax Fairness (ATF), where he is responsible for assisting the executive director in background research for ATF’s various reports and publications, as well as assisting in the management of website content and ATF’s email program. Nick has previously worked at the Securities and Exchange Commission and U.S. Treasury Department. Nick received his bachelor of science in economics from The George Washington University. Bivens, Josh. 2015. 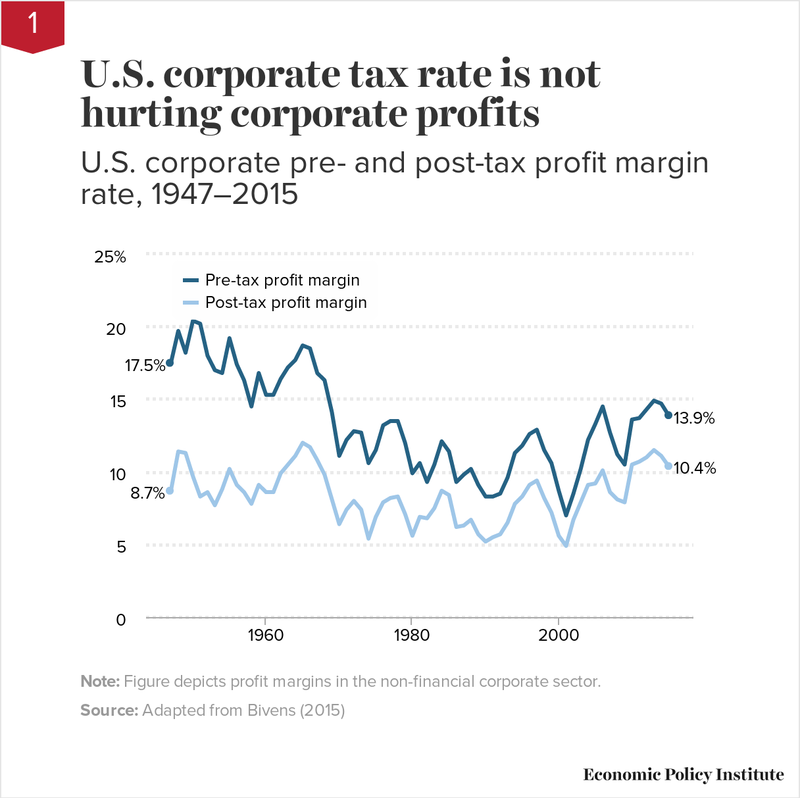 “The Data Show Little Need to Increase Our Coddling of Corporate Profits.” Working Economics (Economic Policy Institute blog), December 10. Bivens, Josh. 2016. Why is Recovery Taking So Long—And Who’s to Blame? Economic Policy Institute report. Bureau of Economic Analysis (BEA). 2016. “Corporate Profits After Tax (without IVA and CCAdj) [CP]/Gross Domestic Product [GDP].” Retrieved from FRED, Federal Reserve Bank of St. Louis. Citizens for Tax Justice (CTJ). 2016a. Fortune 500 Companies Hold a Record $2.4 Trillion Offshore. Citizens for Tax Justice (CTJ). 2016b. 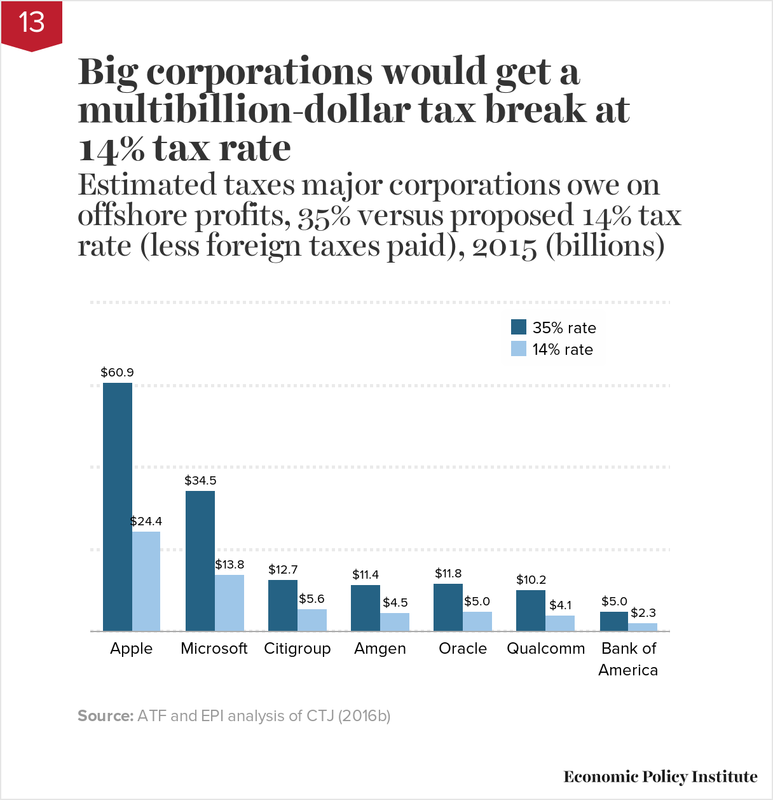 Ten Corporations Would Save $97 Billion in Taxes Under “Transition Tax” on Offshore Profits. Clausing, Kimberly A. 2016. The Effect of Profit Shifting on the Corporate Tax Base in the United States and Beyond. Reed College Department of Economics. Congressional Budget Office (CBO). 2015a. Public Spending on Transportation and Water Infrastructure, 1956 to 2014.
Cooper, Michael, John McClelland, James Pearce, Richard Prisinzano, Joseph Sullivan, Danny Yagan, Owen Zidar, and Eric Zwick. 2015. Business in the United States: Who Owns it and How Much Tax Do They Pay? National Bureau of Economic Research, Working Paper No. 21651. Dharmapala, Dhammika, C. Fritz Foley, and Kristin J. Forbes. 2009. Watch What I Do, Not What I Say: The Unintended Consequences of the Homeland Investment Act. National Bureau of Economic Research. Government Accountability Office (GAO). 2016. Corporate Income Tax: Most Large Profitable U.S. 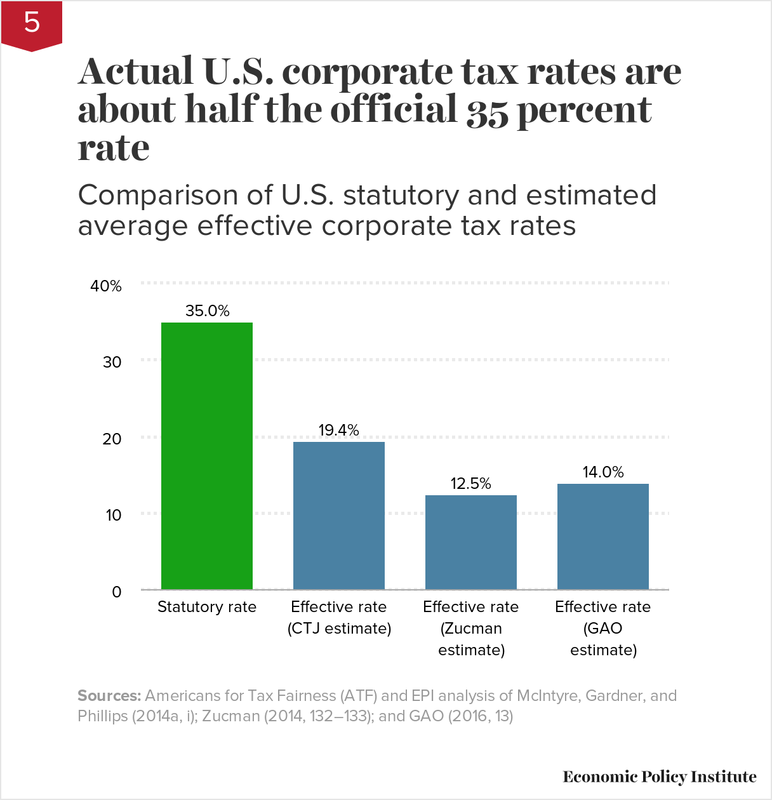 Corporations Paid Tax but Effective Tax Rates Differed Significantly from the Statutory Rate. GAO Publication 16-363. Joint Committee on Taxation (JCT). 2015. Estimates of Federal Tax Expenditures for FY2015-2019. Joint Committee on Taxation (JCT). 2016. Estimated Budget Effects of the Revenue Provisions Contained in the President’s Fiscal Year 2017 Budget Proposal. Kogan, Richard. 2013. Sequestration by the Numbers. Center on Budget and Policy Priorities. Marples, Donald J., and Jane G. Gravelle. 2011. Tax Cuts on Repatriation Earnings as Economic Stimulus: An Economic Analysis. Congressional Research Service. McIntyre, Robert S., Matthew Gardner, and Richard Phillips. 2014. The Sorry State of Corporate Taxes. Citizens for Tax Justice. NPR. 2015. “Apple CEO Tim Cook: ‘Privacy Is A Fundamental Human Right.’” October 1. U.S. Senate Permanent Subcommittee on Investigations. 2011. Offshore Funds Located Onshore. Majority Staff Report Addendum. Zion, David, Ravi Gomatam, and Ron Graziano. 2015. Parking A-Lot Overseas. Credit Suisse. Zucman, Gabriel. 2014. “Taxing Across Borders: Tracking Personal Wealth and Corporate Profits.” Journal of Economic Perspectives, vol. 28, no. 4.